Nikolaos Ntirlis is a computer specialist and supplier of opening ideas for many grandmasters. GM Jacob Aagaard is the only chess author to have won all the major Book of the Year awards. "I have played the French in all of my chess life, but the whole world saw how clueless I was when I tried to use the specialised McCutcheon variation in a few games in Gibraltar. This made the book Playing the French far more interesting to me. Obviously I should have read the book before I played the variation. But doing it the other way round was not without educational benefits! It gave me the chance to think a bit more freely about the opening and not allow myself to be under the control of the authorities. Or more relevantly; it made me far more receptive to what was in the book! I think I will play the variation very differently next time round!" "...an excellent source of inspiration for any French players out there." "Quality Chess has again been able to come up with another highly-recommendable book, with plenty of originality." [A book] of high quality by the very publisher who sets the standard nowadays regarding chess literature." "This complete monograph by Aagaard & Ntirlis recommends the Classical variation with 3...Nf6 in response to 3.Nc3... An advantage is that the structures are not as crazy as in the Winawer Variation and are somewhat easier to play. Players whose French repertoire includes this are well-served by this book." 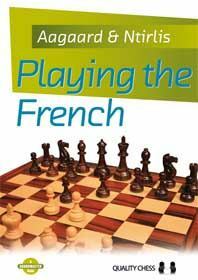 "Playing the French is a high quality repertoire book for the player who has reached a skill level beyond the rudiments. It combines the search for the best lines for Black with the aim of improving the reader's understanding."